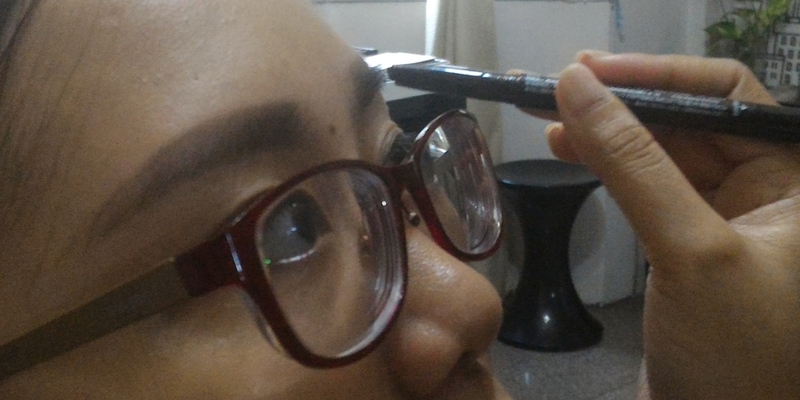 OK, I can’t really read Japanese so not really sure if Sword should be there… A few sessions ago with my trusted brow shaper, I had been introduced to an unbranded and unpackaged automatic brow pencil that is from Japan but made in Korea. It is wedge/triangle shaped and immediately reminded me of Shu Uemura brow swords. Pigmentation is high but the color, I feel, is a bit light even though it clearly says (in English) that it’s dark brown. Unlike my other pencils that apply well but fades once the spoolie is used, this particular one just blends smoothly without losing color… plus the shape allows for tracing with a variety of stroke thicknesses easily controlled by changing the angle of the pencil during application! The pencil had won me over and I had bought one from her for cheap!.. 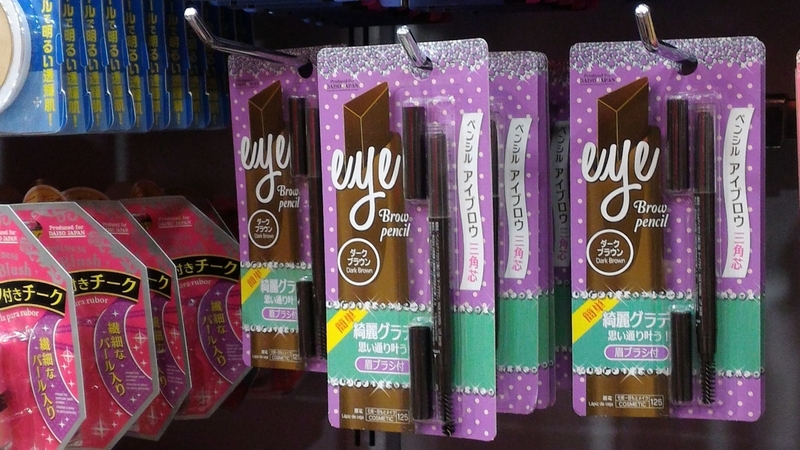 At least until I saw it on shelves at one beauty aisle of the popular 88 peso shop Daiso. Mind you it remains unnamed but the results simply cannot be argued with. It would rank up there among HG status if only it came in some other shades.. though the dark brown works quite well and I seriously urge trying it out especially if your hair color is anywhere between/from red to black. – Triangle shape makes your eyebrow very beautiful. – The lead comes out by one touch turning. – When you use this product, you should check your skin condition such as having skin trouble. – Stop using if it does not fit your skin. Still better than some translated labels out there (you know what I’m talking about ^^). 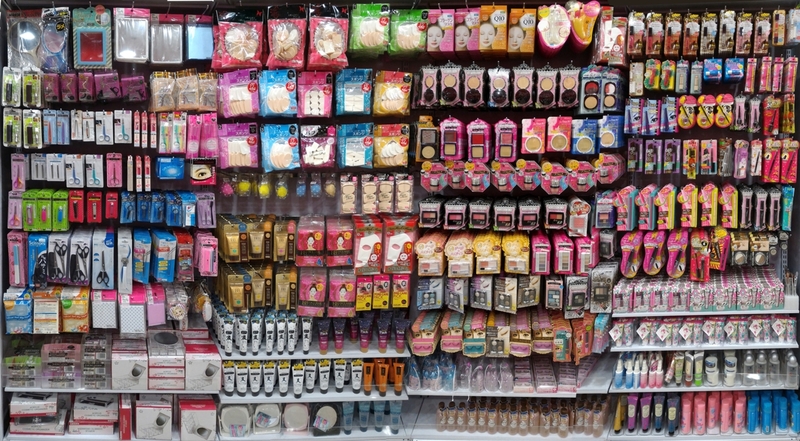 They had this entire aisle of products that could simply be a trove of sorts.. testing these all out may take some time, it’s almost an entirely new category apart from drug/dept store brands. The Daiso eyebrow pencil might just be the tip of the iceberg… found also in this photo are brush cleaners previously suggested by Rae which of course I got a couple of bottles of. I love Daiso finds! I also use one of their eyebrow pencils and I’m feverishly looking out for a replacement, pero mukhang hindi na available, wah! I’ll give this one a try instead, thanks for sharing! This one blends well for me ? i haven’t seen it in manila though. 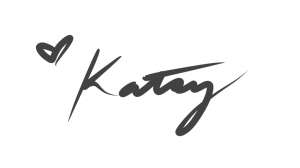 Got my back-up in Tagaytay ?